Background: Anaplasma phagocytophilum is an intracellular organism in the Order Rickettsiales that infects diverse animal species and is causing an emerging disease in humans, dogs and horses. Different strains have very different cell tropisms and virulence. For example, in the U.S., strains have been described that infect ruminants but not dogs or rodents. An intriguing question is how the strains of A. phagocytophilum differ and what different genome loci are involved in cell tropisms and/or virulence. Type IV secretion systems (T4SS) are responsible for translocation of substrates across the cell membrane by mechanisms that require contact with the recipient cell. They are especially important in organisms such as the Rickettsiales which require T4SS to aid colonization and survival within both mammalian and tick vector cells. We determined the structure of the T4SS in 7 strains from the U.S. and Europe and revised the sequence of the repetitive virB6 locus of the human HZ strain. Results: Although in all strains the T4SS conforms to the previously described split loci for vir genes, there is great diversity within these loci among strains. This is particularly evident in the virB2 and virB6 which are postulated to encode the secretion channel and proteins exposed on the bacterial surface. VirB6-4 has an unusual highly repetitive structure and can have a molecular weight greater than 500,000. For many of the virs, phylogenetic trees position A. phagocytophilum strains infecting ruminants in the U.S. and Europe distant from strains infecting humans and dogs in the U.S. Conclusions: Our study reveals evidence of gene duplication and considerable diversity of T4SS components in strains infecting different animals. The diversity in virB2 is in both the total number of copies, which varied from 8 to 15 in the herein characterized strains, and in the sequence of each copy. The diversity in virB6 is in the sequence of each of the 4 copies in the single locus and the presence of varying numbers of repetitive units in virB6-3 and virB6-4. 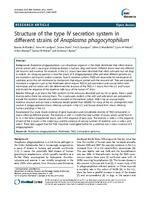 These data suggest that the T4SS should be investigated further for a potential role in strain virulence of A.phagocytophilum.